"There will be no help for you!" Tarzan and Sheena are very similar in many regards. Both reside in the jungle, both hate when man infringes on the peace that is nature and both are formidable when fighting on their own. Pairing them together though is a whole other ballgame and Lords of the Jungle #1 from Dynamite Entertainment is all-in in that regard. The issue is written by Corinna Bechko, illustrated by Robert Castro, colored by Alex Guimarães and lettered by Simon Bowland. Both Tarzan and Sheena are regularly compared to one another and rightfully so, as on the surface their general reasons for being are very similar. Bechko does a great job of underscoring this fact primarily with Sheena, as most of the issue follows Sheena as she's fighting to stop interlopers from destroying an already ancient and seemingly sacred ruin. The event that thrusts Sheena into Tarzan's world is quite jarring and not really explained--it's presumed that it's a direct result of the destruction of the ruins by man. Much of the dialogue throughout the issue Sheena essentially chastising humans, but Bechko's take on it doesn't feel overtly preachy. And the issue seems to purposefully focus on Sheena for the most part, but even with only a slight appearance by Tarzan you get what makes the two characters similar to one another. The artwork by Castro is very strong. Considering a lot of the book is Sheena weaving her way through bullets, spears and fists, Castro does an admirable job of keeping up with the frenetic action. Most of the panels focused on the action feature characters with plenty of facial detail, although there are some instances where the perspective is more distant and the characters feel a little incomplete. The panel layout is very conducive to the flurry of kinetic energy that seemingly radiates from Sheena and keeps the reader on their toes. The colors by Guimarães are bold and present plenty of vivid contrast between the settings, such as the rich blues of the water where the ruins are to the lush greens of the jungle. Lords of the Jungle #1 is a very bold opening to a crossover that makes a lot of sense and is similar to the recent Conan/Red Sonja crossover in that regard. 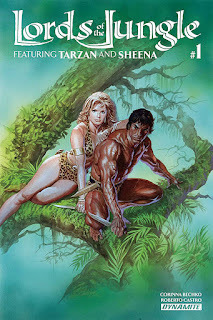 Sheena gets most of the top-billing in the issue, but Tarzan will get his time to shine as well. Bechko's script is very fast-moving and effective at getting the pieces in the right places to advance. Castro's illustrations are adventurous and add a great vibe to the work. Lords of the Jungle #1 is a pretty strong first issue that is setting up what could be a great series. Lords of the Jungle #1 is in stores March 16.